Yothalot works with RabbitMQ for inter process message queuing. All jobs that you assign to Yothalot, and the communication between jobs use RabbitMQ message queues. 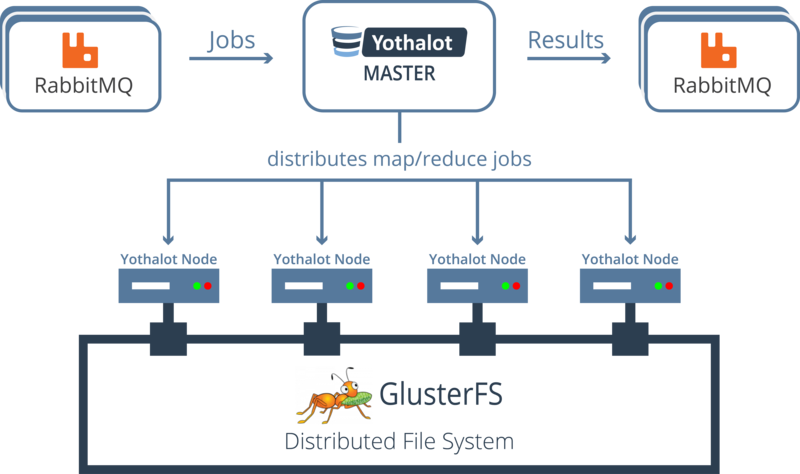 GlusterFS automatically distributes files over the servers in the cluster, keeps track on which server the files are stored and replicated data over multiple servers. Yothalot comes with a straight forward but powerful PHP API. It is the simplest and most popular API that allows you to write map/reduce jobs and send them to the Yothalot cluster. If you prefer speed over simplicity, Yothalot also comes with a C++ API. With this API you can write super fast C++ applications that run map/reduce jobs. If you have a lot of data and want to process it using either native C++ code or simple PHP scripts, Yothalot is the tool for you. Write applications that run map/reduce jobs with PHP or C++ API. RabbitMQ sends these jobs to the Yothalot master node, which will send your object to one or more nodes in cluster where the actual algorithm will run. When the job is done the Yothalot master node sends the results to RabbitMQ message queues.